Many women get too little sleep, despite considerable evidence showing the importance of sleep to overall health. Now a new UC San Francisco study has discovered another reason why inadequate sleep may be harmful, especially to women and their hearts. The study found that poor sleep - particularly waking too early - appears to play a significant role in raising unhealthy levels of inflammation among women with coronary heart disease. The elevated inflammation affected only women, not men, even when adjusted for medical, lifestyle and socio-demographic differences, the authors said. The findings highlight potentially important gender differences and provide evidence that inflammation may serve as a key biological pathway through which poor sleep contributes to the progression of heart disease in women, the researchers reported. The study will be published online on June 5 in the Journal of Psychiatric Research. "Inflammation is a well-known predictor of cardiovascular health," said lead author Aric Prather, PhD, a clinical health psychologist and assistant professor of psychiatry at UCSF. "Now we have evidence that poor sleep appears to play a bigger role than we had previously thought in driving long-term increases in inflammation levels and may contribute to the negative consequences often associated with poor sleep." Scientists have documented that poor sleep - generally defined as fewer than six hours a night - is a risk factor in a number of chronic health conditions, including coronary heart disease, and is associated with elevations in markers of inflammation. The goal of the UCSF study, which began in 2000 and involved nearly 700 people, was to examine the association between self-reported sleep quality and changes in inflammation levels over five years in older people with stable coronary heart disease. Participants were recruited from UCSF, Veterans Affairs Medical Centers in San Francisco and Palo Alto, and nine public health clinics in the Community Health Network of San Francisco. The average age of the men was 66 compared to age 64 among women. On average, the women had higher systolic blood pressure, were more likely to be taking antidepressants, and less likely than men to have a history of taking beta-blockers, statins or other medications that treat blood pressure and other coronary-related ailments. 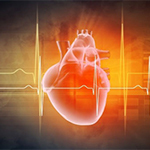 All participants had coronary heart disease, a condition marked by inflammatory activity. Participants were asked when they first enrolled and five years later: "During the past month, how would you rate your overall sleep quality?" Their choices were "very good," "fairly good," "good," "fairly bad," or "very bad." Biomarkers assessed in the study were Interleukin-6, C-reactive protein, and Fibrinogen. The researchers found that poor sleep quality was significantly associated with five-year increases in the biomarkers in women but not men: Women who reported very poor or fairly poor sleep quality showed a percent increase in markers 2.5 times that of men who said they slept poorly. The association remained statistically significant after adjustment for characteristics such as lifestyle, medication use and cardiac function. The women in the study were largely post-menopausal, so the researchers hypothesized that lower levels of estrogen could help explain the inflammatory activity associated with poor sleep. "It is possible that testosterone, which is at higher levels in men, served to buffer the effects of poor subjective sleep quality," the authors wrote. - A third of the women said they had difficulty falling asleep (31 percent among men). - The researchers note that men comprised the majority of the study subjects, but point out that their findings may actually underestimate the real effects given the limited sample size. They say that further investigation is needed to explain the gender-specific associations between poor sleep quality and markers of inflammation which could help clarify gender disparities in coronary heart disease. The results could add to established evidence of the importance of assessing and treating sleep disturbances in high-risk populations, including those with heart disease, the authors said. Co-authors are Elissa Epel (http://profiles.ucsf.edu/elissa.epel), PhD, UCSF associate professor of psychiatry; Beth Cohen (http://profiles.ucsf.edu/beth.cohen), MD, MA, assistant professor of medicine at UCSF and a physician at the UCSF-affiliated San Francisco VA Medical Center; Thomas Neylan (http://profiles.ucsf.edu/thomas.neylan), MD, UCSF professor of psychiatry and a physician at the San Francisco VA Medical Center. The senior author is Mary Whooley, MD, a UCSF professor of psychiatry, epidemiology and biostatistics and a physician at the San Francisco VA Medical Center. The research was funded in part by Grant K08HL112961 from the National Institute of Health and the National Heart, Lung, and Blood Institute; and a Robert Wood Johnson Foundation Health and Society Scholars fellowship to Aric Prather. The Heart and Soul Study was funded by the Department of Veterans Affairs; the National Heart, Lung, and Blood Institute (R01 HL079235); the American Federation for Aging Research; the Robert Wood Johnson Foundation; and the Ischemia Research and Education Foundation.